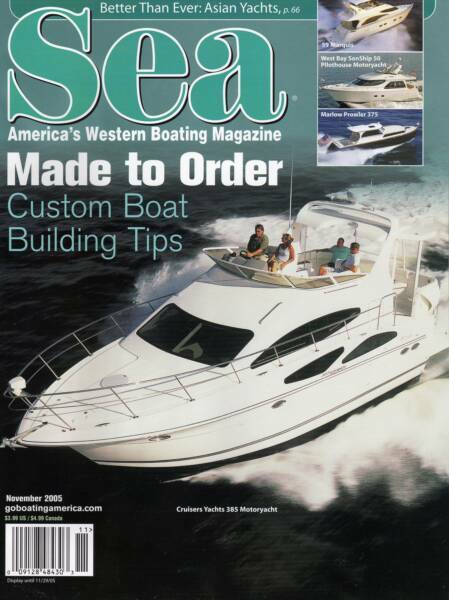 The Popular Boating Magazine, Sea Magazine, gives the highest distinction for the Ida May and lists it as one of the Top 25 Classics: Boats You'll Never Forget. 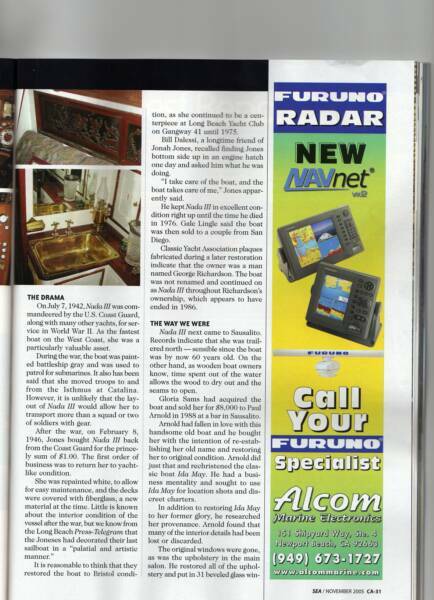 Here is a page from the Long Beach Yacht Club's 75th Anniversary Book. 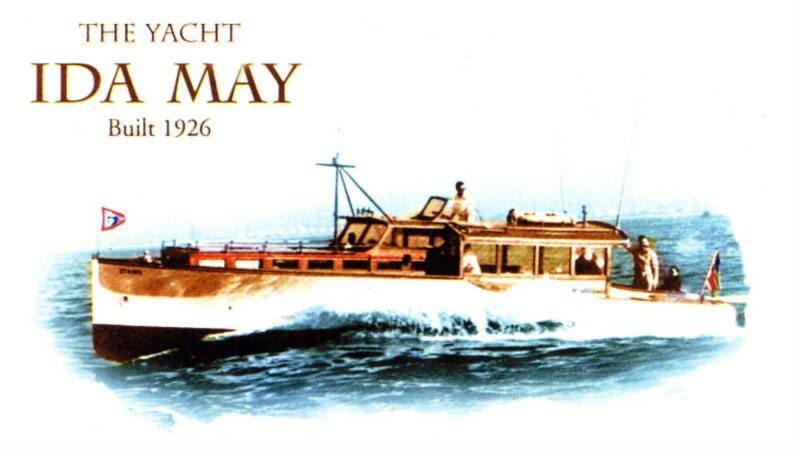 Jonah Jones, Jr. the third owner of the Ida May (Nada III) was the founder of the Long Beach Yacht Club and an attorney of Howard Hughes. 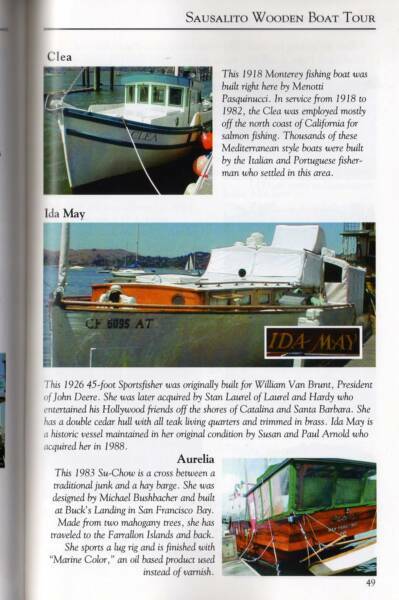 Article on the Ida May in About The Bay, during one of its' previous restoration projects in 1988. 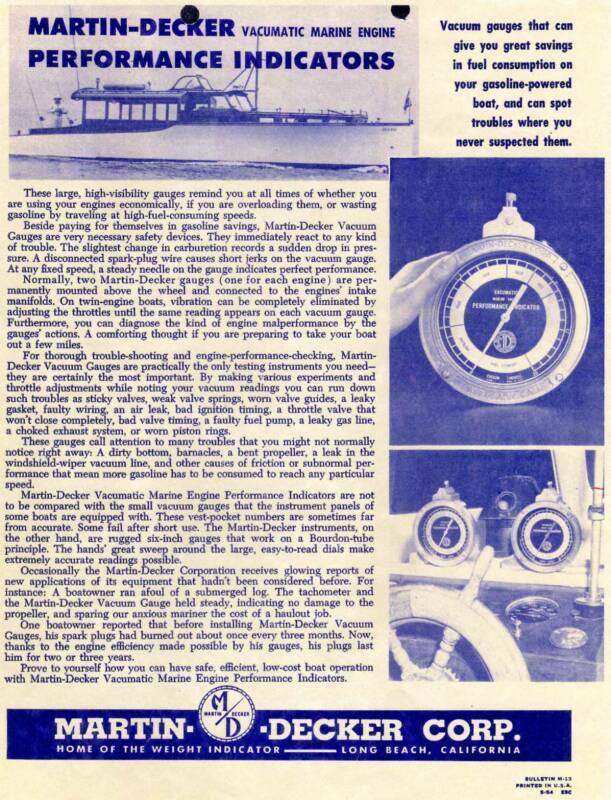 The Ida May cruising in the Classic Yachting Newsletter, 1995.
advertisement for Martin-Decker Performance Indicators! 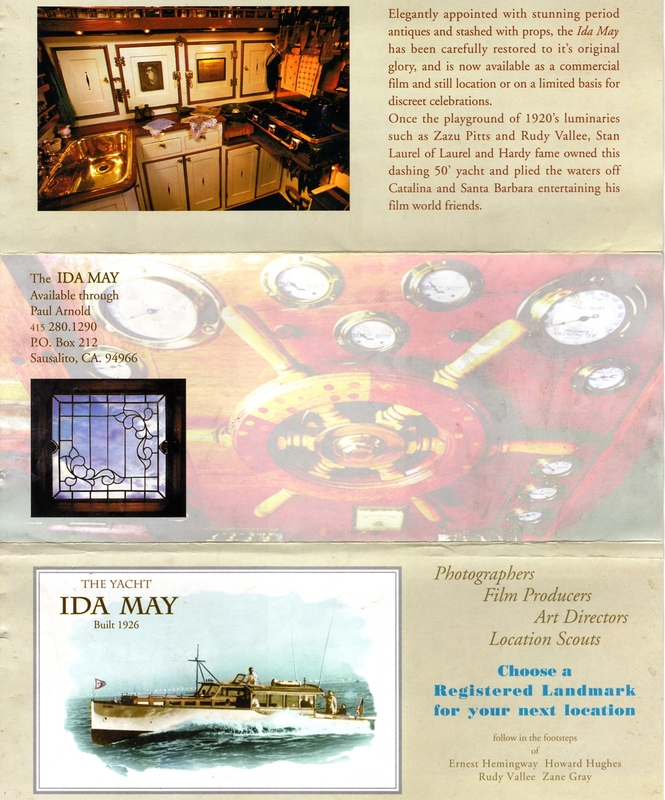 The Ida May is Turning Heads Again, in The Ark Newspaper. 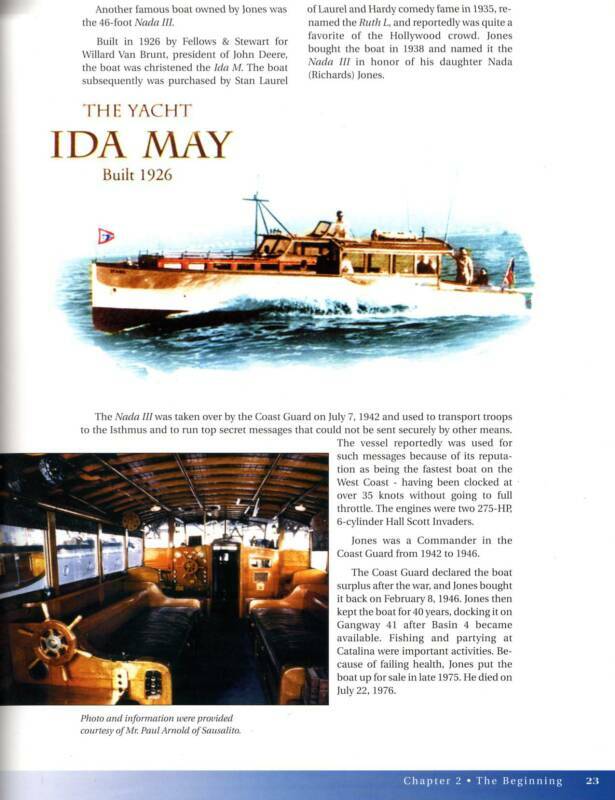 Mr. Paul Arnold, a previous owner of the Ida May utilized the boat for charter services. Here is the front and backside of a brochure he created. 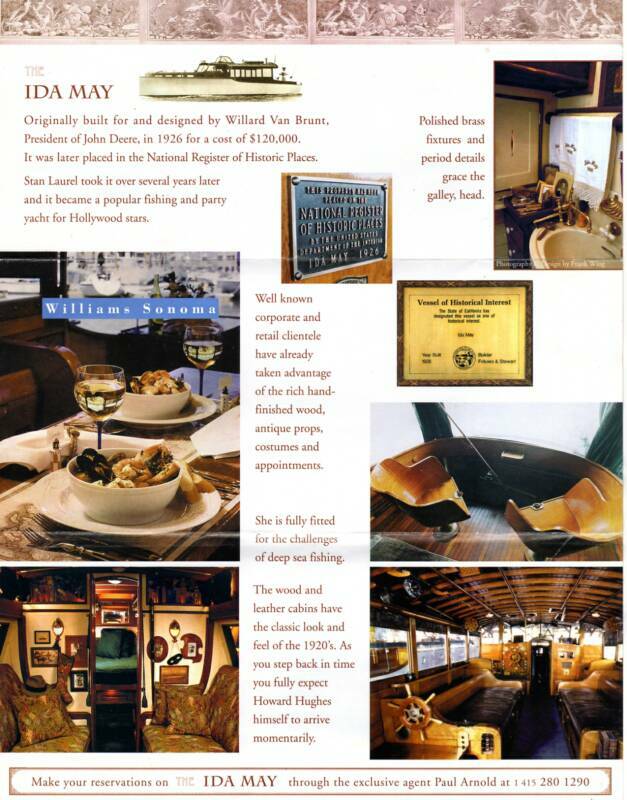 An article about the Ida May in the November 2005 issue of Sea Magazine. 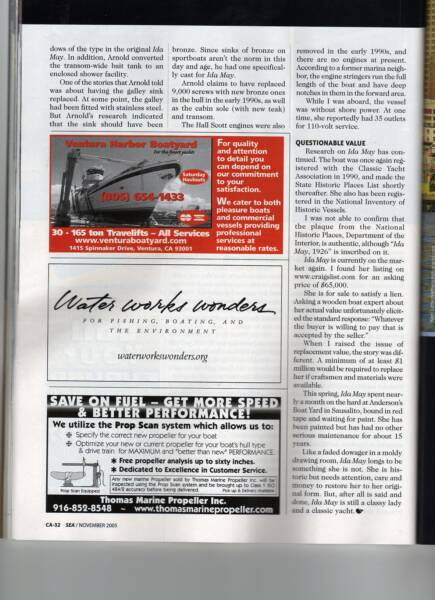 This is a 3 page feature article in the California section. 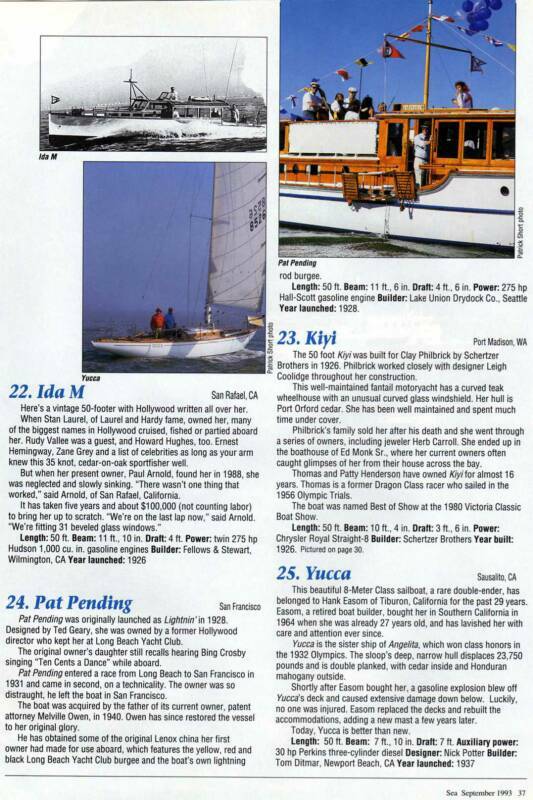 The Ida May listed in a Sausalito wooden boat tour with other historic boats. 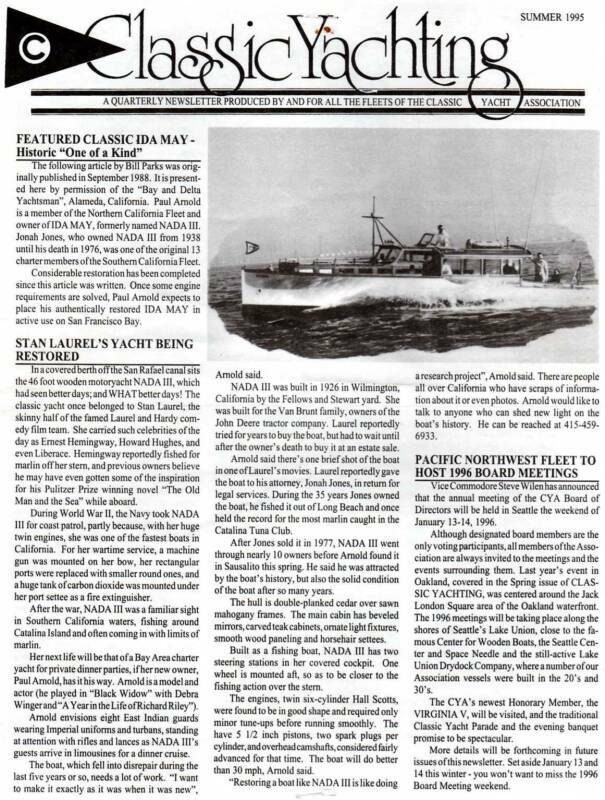 See Laurel and the Ruth L. in the news!!! Willard Van Brunt poses with a 6-foot, 157-pound tuna fish he caught on his 78th birthday in 1925 and later donated to the Masonic House in Dousman. Van Brunt caught the tuna aboard a boat he later took to California in his retirement, a boat which went on to host future President Herbert Hoover on a fishing expedition and was later bought by Stan Laurel of the famed comedy duo Laurel & Hardy. OCONOMOWOC - Steve Wynn is looking for a tuna, but not your garden variety albacore or yellow fin. He seeks an historic fish with links to both local history and Hollywood’s golden age. The stuffed fish, which weighed 157 pounds and was 6 feet long when it was caught more than 80 years ago, was originally presented as a gift to the Masonic Home in Dousman. Now, nobody seems to know where it is. "I have absolutely no leads," said Wynn, who lives in California. "Funny, I feel like we’re trolling for this fish some 80 years after Willard Van Brunt caught it the first time, only instead of a kite dragging a flying fish across the water behind the Ida May, I’m trolling with e-mails, correspondence and research." Bryan J. Polinske, administrator of senior living services for Three Pillars, formerly the Masonic Home, said the whereabouts of the tuna are a mystery to him as well. "I have checked with our maintenance department, residences, and no one knows where our tuna fish is," Polinske said. The fish was caught by Van Brunt on his 78th birthday in 1925. He gave the mounted fish to the Masonic Home in February 1926. Van Brunt retired to California shortly after donating his farm in Dousman to the Grand Lodge of Free & Accepted Masons for the Masonic Home. 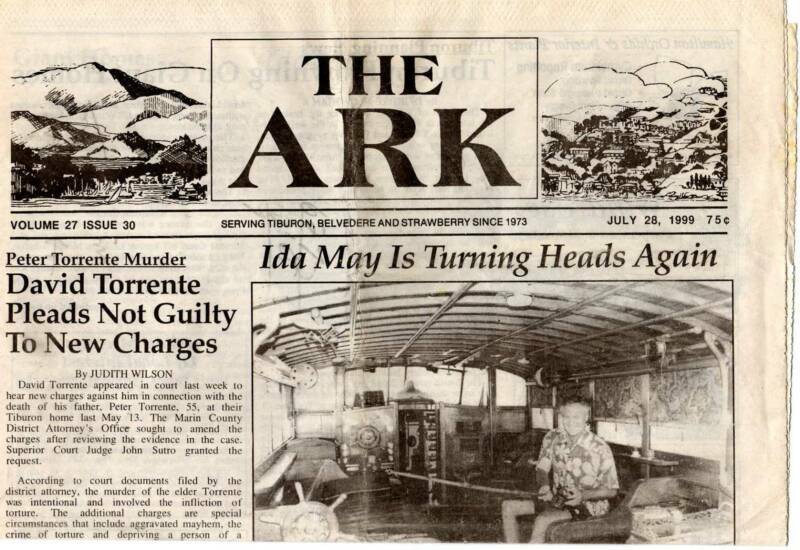 Wynn, who now is co-owner of Van Brunt’s yacht, the Ida May, wants the tuna as part of an exhibit in California, which will include a restored Ida May. 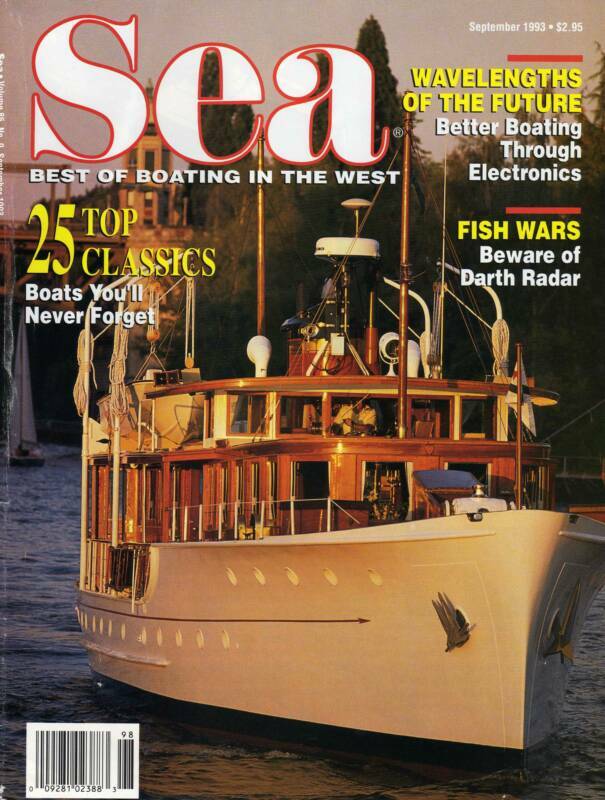 Wynn and a friend bought the yacht about 18 months ago and have been restoring it as a historic vessel with the National Park Service. This restoration project is documented at www.idamay.org. "We are preparing an extensive exhibit for the San Francisco Maritime Museum, for when it reopens in a couple of years," Wynn said. 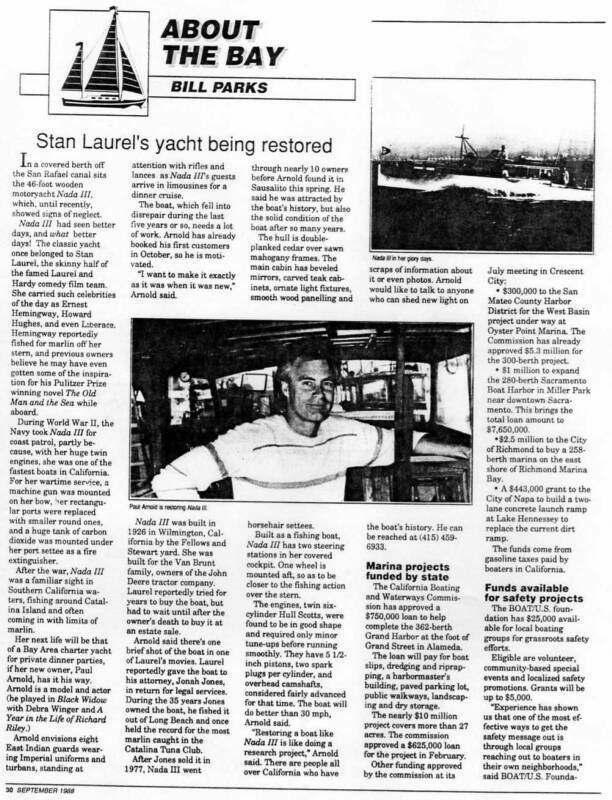 "The history (of the yacht) is even more interesting, as the second owner was Stan Laurel of Laurel and Hardy. As you can understand, we are most interested in learning the whereabouts of the mounted tuna, if it still exists, as it is the only known preserved fish caught by Mr. Van Brunt." Wynn said the Ida May is significant for a number of reasons. "She is believed to be the most expensive private fishing cruiser ever built up to that time ($120,000 at the time it was built). No expense was spared, and she was quite innovative in her design. 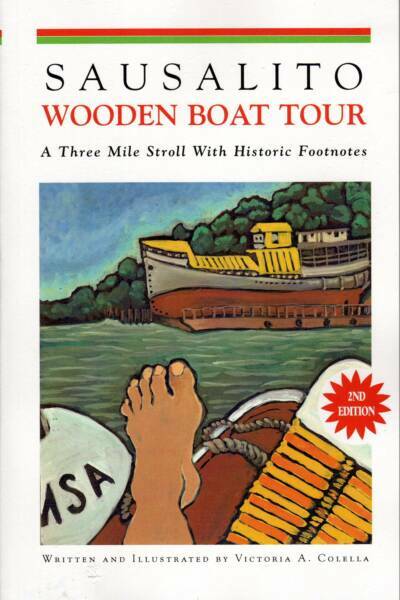 She was known to be the fastest boat on the West Coast," he said in an e-mail interview. 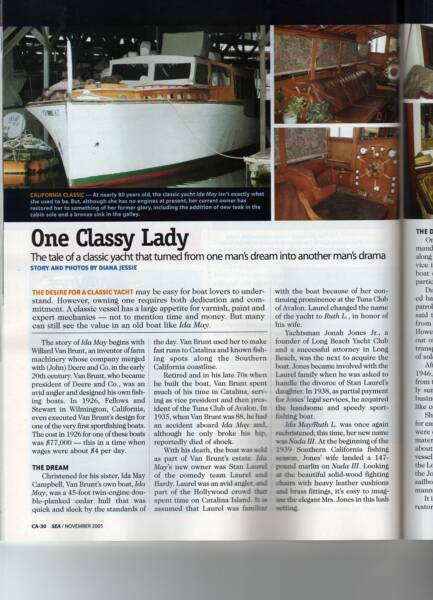 "She was designed by Hugh Angelman, known as the ‘Grand Old Man of Pacific Yachting.’ Willard Van Brunt was very involved in every detail of her design.